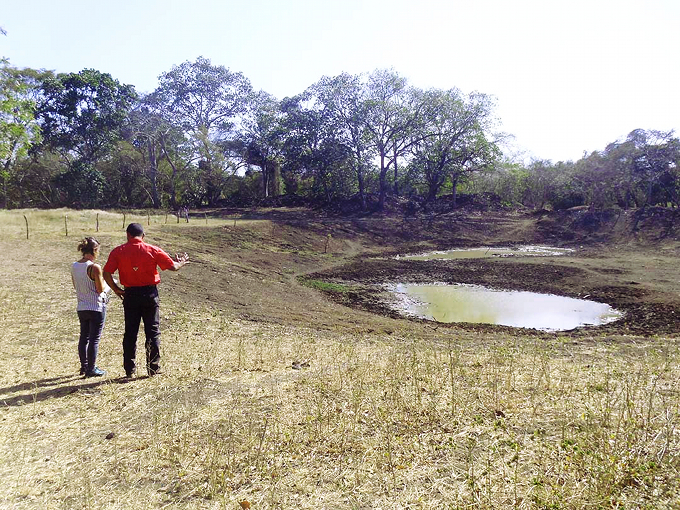 The ponds from which cattle drink are disappearing. Photo by MIDA. We have a water crisis caused by a drought that’s worse than any other on record, but also caused by water systems and water policies that are woefully inadequate. However, we also have many fine civil engineers and a lot of people without so much formal education who have built and maintained inexpensive and usually functional local water systems. We need to have a national dialogue about water — about what we need and how we are going to pay for it. In any discussion that is truly national in scope wrong ideas and impractical dogmas will be advanced. There will be those who can’t conceive of situations or solutions that are different from those which they have seen. But because the water supply is not too advanced a subject for most people to learn, we can make informed democratic choices rather than completely turning our decisions over to supposed technocrats who are likely to have undisclosed interests. It should be hoped and expected that by the time a national water dialogue gets underway, the rains will have begun and the crisis will be less acute. However, the problems will be back. We need new water sources, some reconfigurations of our delivery systems and some changes in political and economic arrangements to go along with the physical changes. So to whom should we listen? President Varela campaigned on bringing running water to every household and we should look to him for leadership, but not give up if he disappoints us. The technical people at IDAAN and for the local water systems ought to get a careful hearing, even as we take into account weaknesses in these institutions. Panamanians and foreign residents from all walks of life should be encouraged to weigh in. It’s everybody’s problem. On the other hand, climate change is driving a lot of the crisis and individuals, companies and public institutions with histories of climate change denial should be identified as such and paid little heed. Those with economic interests which they would conceal should be outed and shamed, even as we listen to those with honestly admitted stakes in the decisions to be made. Panama’s system of education is and has been abysmal, but Panamanians are not stupid. The water crisis challenges us to educate ourselves and act intelligently. We should do these things for ourselves. Panama’s path to financial transparency is irreversible. To that end, we willingly and actively support diplomatic dialogue and domestic reform to address this global challenge. As Panama has reiterated on multiple occasions to members of the OECD, we are fully and immediately committed to the implementation of bilateral automatic exchange of information consistent with the goals of the Common Reporting Standards. Further, we are open and willing to engage in ongoing international dialogue with relevant technical teams to evaluate the specific multilateral mechanisms needed to implement these standards. President Juan Carlos Varela points out that our corporate secrecy laws date back to 1927 and were copied from those of the US state of Delaware. He and many others complain that Panama is unfairly singled out, and faces unreasonable demands that our little country become the tax enforcer for big and rich industrialized countries. But we have a regional Red Cross disaster relief center here, and a law firm that is deeply embedded in Varela’s party and administration fraudulently used the name of the Red Cross as a purported beneficial owner of shell companies in order to conceal the activities of wealthy interests that have nothing to do with the Red Cross. Yes, it can be argued that Panamanian “mirror companies” with the same or similar names as those of well-known companies elsewhere in the world but with no other connection to the reputable firms are legal here, and that identity theft is not a crime here. So does that make everything proper? Everything is not right. Even if Panama is being disproportionately singled out because the leak came from one of our “offshore asset protection” law firms, that’s still not an excuse to pretend that nothing is wrong. Yes, there is a lot of money involved, but no, shell games and fraud are not sustainable bases for the Panamanian economy. Poverty and ignorance are the two great allies of the totalitarian enemies of freedom.